Nature’s Science Garcinia Cambogia™ is made with natural ingredients. 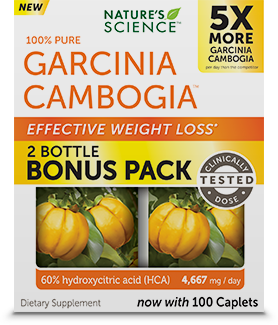 Unlike other products, Nature’s Science Garcinia Cambogia is made with premium garcinia cambogia that supplies 60% HCA, which is the active weight-loss component of garcinia cambogia. Nature’s Science Garcinia Cambogia has been scientifically formulated to deliver the exact clinically tested dose of 4667mg of garcinia cambogia per day that is needed to see results! That is 5X more garcinica cambogia per day than the competitor’s daily dose of 750mg.